You may remember that my granddaughter Erin asked me to make her an Elephant Quilt like the one below. I told her I'd be happy to, but she couldn't be in a hurry. She wanted her elephant to be blue. I really didn't like much about the above quilt. Way too much white, with an elephant plopped down towards the bottom. I was sure I could do better, while keeping with the spirit of what Erin asked for. I decided to do small 3" triangles for the elephant body, and some square patchwork for the ear. I tried to place a bit of dark where I thought the eye should be. I did some green HSTs to imitate grass; and found some blue batik for the "sky". I used Kona Deep Blue for the binding. Over all I'm very pleased with the quilt top. Below is the back. I used some leftover 3" triangles for the center band. Erin moved to the North Carolina Coast, this month, and so far I don't have her new address! When I get it the Blue Elephant Quilt will be on it's way. Oh my!! 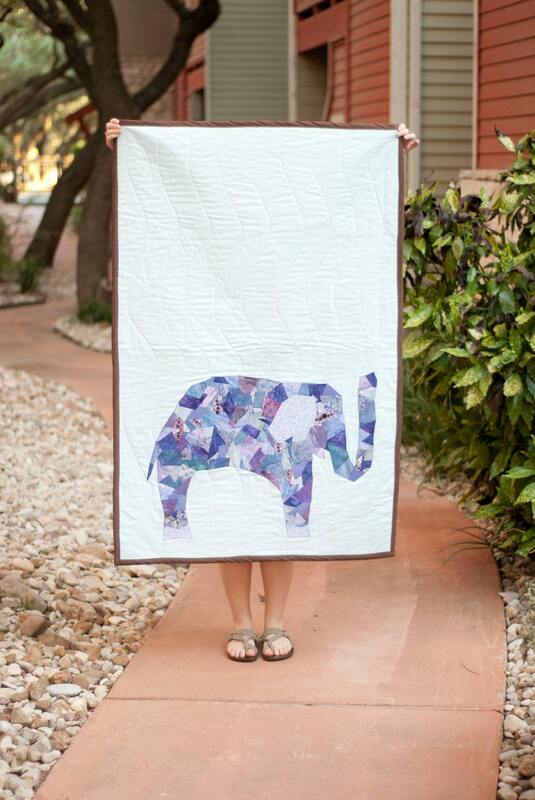 This elephant quilt is wonderful. I'm sure your granddaughter is/was thrilled with it. So very creative, and I agree that there's way too much white in the original quilt. I like all the color that you added. I like the idea of a background for the elephant. It makes it seem more like a picture . Then something just floating on the fabric. You are amazing! I love it! You have the best eye fro colors...something I stink at! So adorable!! beautiful elephant and love the grass! Oh my goodness, I love the elephant! I like your revision to the background, it looks really good. Wonderful quilt!! You have done an awesome job. The patchy elephant is perfect. A masterpiece! She will love it forever, I'm sure. I'm enjoying your quilts and blog. This is really cute! I am sure she will love it.